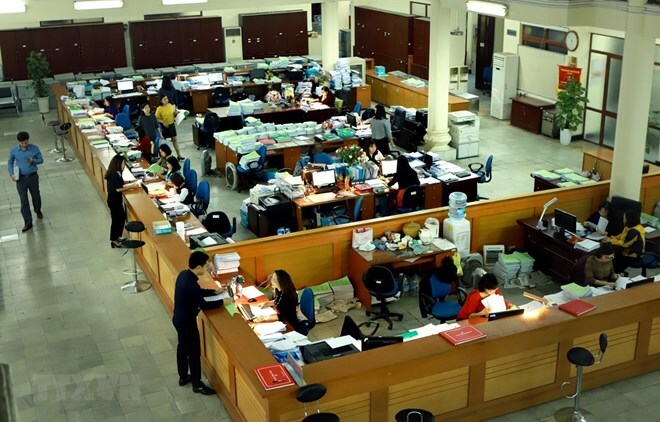 Hanoi (VNA) – The State Treasury of Vietnam mobilised more than 14.2 trillion VND (612.56 million USD) via 16 Government bond (G-bond) auctions on the Hanoi Stock Exchange (HNX) in March. The total sum was 24 percent lower than the amount recorded in the previous month. According to the HNX, some 27.5 trillion VND (1.18 billion USD) worth of bonds were offered, and the bidding volume doubled the offering in the month. Successful bidders of five-year bonds will enjoy an annual yield of 3.7 percent, ten-year bonds between 4.7 and 4.72 percent, 15-year-bond between 5.02 and 5.06 percent, 20-year bonds between 5.2 and 5.56 percent, and 30-year bonds 5.8 percent. Compared with February, the coupon rates of five- and 20-year bonds fell 0.17 percent and 0.36 percent per annum, respectively. Meanwhile, the rates increased for bonds with maturity of 10 years (0.02 percent), 15 years (0.06 percent) and 30 years (0.06 percent). In the G-bond secondary market, the total volume of G-bonds sold by the outright method exceeded 765 million, equivalent to 83 trillion VND (3.58 billion USD), up 22 percent in value from the previous month. The trading volume through repurchase agreements (repos) reached more than 1.17 billion bonds, worth more than 118 trillion VND (5 billion USD), rising 54 percent in value month on month.